Salty Spam simmered in a teriyaki style sauce and then shaped with steamed rice and wrapped up in nori sheets. It’s a great grab and go snack. Spam Musubi: Place washed rice in rice cooker adding salt and soy sauce to water. Cook as directed. In a skillet over medium heat; fry spam until browned to desired doneness on both sides. Add sauce ingredients; simmer 5 minutes. On work surface; using a Spam Musubi Mold or by hand; shape rice into 2 pieces of ¾-inch deep rectangles the length and width of slices of Mold/Spam. Sprinkle one rice rectangle with furikake. Top with slice of Spam. Place 2nd rice rectangle onto Spam; shape firmly. Onto dry area of work surface; place piece of nori. Place musubi in center of nori. Wrap the end of nori closest to you around musubi; moisten far end with water. Bring far end of nori to seal musubi.Note: If Spam musubi molds are not available; Spam can works great! Remove bottom end of can.Keep mold wet while preparing musubis. Makes 8-10 musubi. Hot Dog Musubi: Place washed rice in rice cooker adding salt and soy sauce to water. Cook as directed. In a skillet over medium heat; boil hot dog in water until water evaporates. Cut hot dogs to length of mold. Set aside. 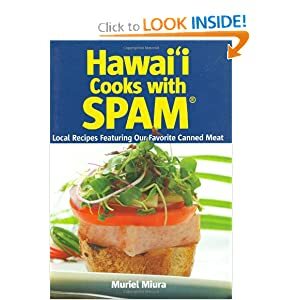 On work surface; using a Spam Musubi Mold or by hand; shape rice into 2 pieces of ¾-inch deep rectangles the length and width of slices of mold.Spoon 1 ½ tsp. of relish mixture onto rice rectangle. Top with hot dog; place 2nd rice rectangle onto Spam; shape firmly. Onto dry area of work surface; place piece of nori. Place musubi in center of nori. Wrap the end of nori closest to you around musubi; moisten far end with water. Bring far end of nori to seal musubi.Note: If Spam musubi molds are not available; Spam can works great ! Remove bottom end of can.Keep mold wet while preparing musubis. Note: You will use up the cut ends of the hotdogsyou’re your last 2 musubi, or you can snack on those pieces. Makes 6-8 musubi (if you are snacking ! ).